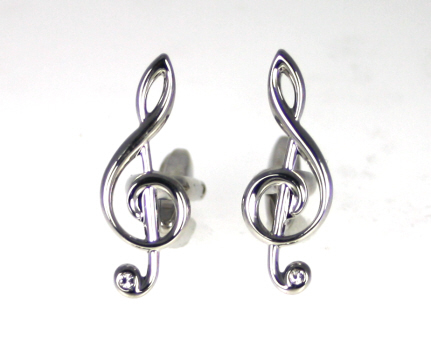 A pair of treble clef music cufflinks in silver with a small crystal to complete the look. This novelty gift for any musician should be music to your ears! Men's Trouser Braces with Music Notes and stave. A pair of cotton handkerchiefs with treble clef music note design in blue and white, presented in a smart gift box. Music motifs on plain tie. Symbols include French Horn, Oboe, Violin and Piano,Themes available in two colours. A neat, treble clef on a silver tie clip with single diamante contained within. A beautiful accessory for musicians and music lovers. A stunning miniature gold coloured treble clef brooch enhanced with a row of diamanté.